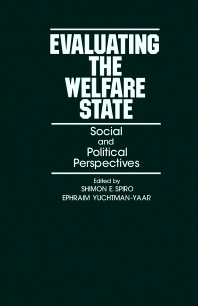 Evaluating the Welfare State: Social and Political Perspectives together with its companion Social Policy Evaluation: An Economic Perspective is the outgrowth of an international and interdisciplinary conference on policy evaluation held at Tel Aviv University in December 1980. The conference brought together scholars from the fields of economics, sociology, political science, social work, and administration. The papers presented at this conference approached the welfare state and social policy evaluation from a number of different theoretical and methodological perspectives. A selection of these papers has been included in this volume. The book is divided into five parts. Part I is devoted to the political antecedents and consequences of the welfare state and to the social and psychological processes that affect the development of social policies and reactions to them. Part II analyzes the discontinuity between policies that are the subject of public debate, and the programs that affect the well-being of populations and the distribution of resources. The chapters in Parts III and IV present current developments in the practice of evaluation and explore the frontiers of this field. Part V focuses on the relationship of evaluation to policymaking. This involves examinations of the culture of political debates, the nature of choices facing policymakers, and the impact of research on policy. What is "The Welfare State"?